With time, Smartphones have become bigger, better and smarter that can be used for almost any purposes, be it watching a movie, chatting with friends or sharing documents with others. However, the fundamental reason for keeping your phone with you is communication, which may not be possible if you don’t have the contact number of the person you want to talk. Moreover, in 21st century, most of the people rely on digital address book. However, you need an application that gives tidy and organized address book. As there are numerous contact manager apps available on App Store, to save you from the hassle of choosing the best app, we have chosen an app that not only comes with rich features and utilities but also is useful for cleaning your incorrect, superfluous, incomplete and duplicate contacts with a single click. Here, we’re going to discuss on how to manage contacts on iPhone with “Tuneup Contacts”. Tuneup Contacts is a simple yet powerful tool that is beautifully designed to help you organize and manage your address book in real time. It has wide-range of features that quickly clean up duplicates, create contact groups, merge contacts, share contacts, remove zombie contacts, allow backup and give you well-organized address book. The app is also capable to share contacts and batch contacts with your dear and near ones. As known, duplicate contacts are really annoying, especially when you’ve hundreds of contacts added in your phone book. 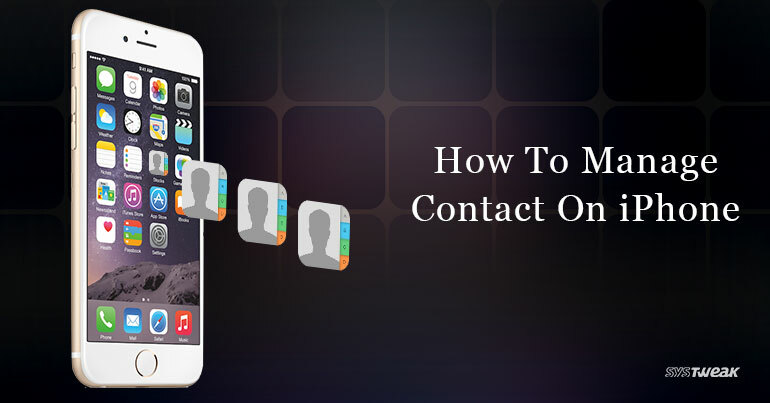 Moreover, deleting your contacts manually is a painful and time-consuming task. However, Tuneup Contacts helps you automatically delete hundreds of contacts from your iPhone in just one click. Before deleting the duplicate contacts, you can preview all the contacts. So, you won’t end up deleting any of your important contacts. In case you have two different phone number of the same person, you can combine both the numbers in one entity. Contacts are a vital part of our lives, especially the business contact details. Whether you want to change your smartphone or the phone crashes, there are many reasons to make you lose your essential list of people. However, to avoid this situations, you can back up the entire address book or store your contacts online. Tuneup Contacts makes sure your contacts are always stored at a safe place. Sending group messages not only saves your precious time but also reduces the possibility of sending corrupted messages to your contacts. It is indeed a best thing since sliced bread that frees you of unnecessary labor. Tuneup Contacts is loaded with in-built ultimate contact remover and optimizer features, which are accessible through its user-friendly interface. You can get rid of zombie contacts in no time. It is compatible with iPhone, iPad and iPod touch but the only condition is, it should have iOS 6.0 or later. Overall, it is a productive software that manages contacts on iPhone and helps you to find and remove duplicate contacts instead of merging. You can rely on the tool to get freedom from a messed-up address book. Download and install Tuneup Contacts and let us know what you think about it.